Blog covering modern Australian stamps. Information on new issues, reprints, postal stationery, exhibitions, most of which is unavailable elsewhere. At least five new stamps will be released on 1 October for the new international rates which take affect on 6 October. The $2.75 stamp is also available in self-adhesive booklets of 5, and should also be available as a Personalised Stamp™. The 2006 $1.85 Tasmanian Devil stamp will remain on sale, with the 2007 $1.95 Sydney Harbour Bridge sheet stamp being reissued to post offices. Both stamps will be released in self-adhesive booklets of 5. This is the first time the $1.85 Devil stamp has been issued in this format. Although the $1.95 Bridge stamp was issued in self-adhesive booklets of five and a prestige booklet in 2007, this 2014 printing is a complete new booklet, by a different printer. As Personalised Stamps™ are vertical designs, it is likely the $1.85 Melbourne Exhibition Centre design will remain on sale, with the $1.95 Sydney Harbour Bridge design being reissued. 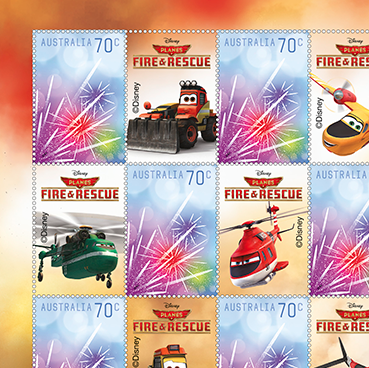 Post offices started to receive stamps of the Blinky Bill and Nutsy Classic Collection sheetlet pack from 1 September, with stocks of the Disney™ Planes sheetlet pack arriving 10 September. 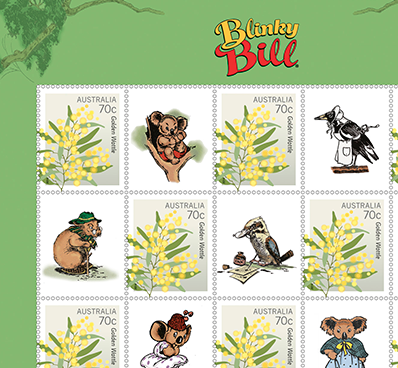 The Blinky Bill pack contains the first example of the 70c Wattle stamp with a tab, while the 70c Fireworks stamp in the Planes pack has been used before in previous packs. * Rate is valid for November and December only. There are no changes to seasonal card prices. ** The $1.85 Melbourne Exhibition Centre stamp currently on sale for the current Asia/Pacific rate, may remain on sale for the new New Zealand rate. The $5 Twelve Apostles stamp from 2000 could be placed back on sale, as happened with the 2000 $4.50 Flinders Ranges stamp a couple of years ago. However, Australia Post's website does not list a $5.00 stamp as being currently on sale, although reprints of the stamp continue to be made. With the release of the Husky issue for the Australian Antarctic Territory, Australia Post appears to be selling a two new 'Issue Collection' packs. The 'Issue Collection Standard' includes the stamps, first day cover, maximum cards and stamp pack; while the 'Issue Collection' includes one of everything released for the collection (stamps, miniature sheet, both first day covers, maximum cards, stamp pack and gutter strips). No doubt these are designed to make ordering online easier, but I wonder how the contents of the packs were decided upon. The 'Standard' packs contents are particular curious as the only inclusion of the miniature sheet is in the pack. It will be interesting to see if future issues will include 'Issue Collection' packs. Specialist Australian stamp collector. Writer of 'A Closer Look' column in Stamp News Australia.